According to what I’ve read, Thomas Keller of the French Laundry was responsible for the layered version Remy would present, called a confit byaldi. 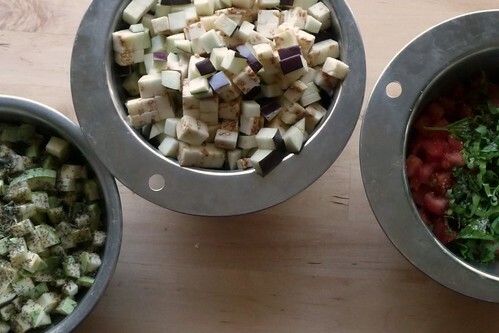 I don’t have a mandoline and while I’m passable with a knife, I’m not good enough to hack my way through a bunch of veggies, leaving only a trail of perfect 1/8″ slices behind, so I opted to simply dice them all. Ratatouille can be simple or complex, cooked solely on the range or layered as a casserole, left on its own as a main with bread or served as a side, even made into fillings for crepes. During my research, I was extraordinarily tempted by this Ratatouille and Goat Cheese Salad with Pesto Vinaigrette at epicurious.com. The grocery budget started groaning in dismay at the quantity of chevre needed, so I reluctantly set that recipe aside for when I start making my own. 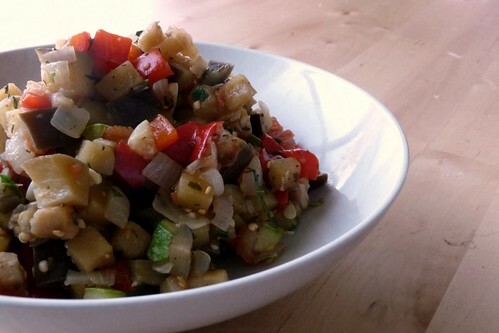 Traditionally, ratatouille contains some or all of the following: tomatoes, squash, eggplant, zucchini, bell peppers (red and green), plenty of onion, and basic herbs such as thyme, marjoram, basil and parsley. Some chefs like to make a sauce out of the herbs, onions and tomatoes, then layer the other vegetables into a casserole which is then baked, others simply throw it all into a pan (at varying intervals, of course) which is what I opted to do. I’m glad I finally made this. It was excellent, the flavors melded beautifully… Still, I keep thinking this needs a nice lemony vinaigrette to really round it out. Maybe you might disagree, but have it on hand, just in case. In a large, deep saute pan over medium heat, add olive oil. When hot, add onions, shallots and garlic. Saute, stirring occasionally, until onions begin to caramelize, about 5- 7 minutes. Add eggplant, continue cooking for about 5 minutes. Add the bell pepper, zucchini, squash (if using), and thyme. Cook for an additional 5 minutes. Add remaining ingredients: tomatoes, salt, pepper, parsley and basil, and once again cook for about 5 minutes. 1. This can be made well in advance and reheated or served at room temperature. This entry was posted in dairy-free, french, gluten-free, recipes, untranslated, vegetable, vegetarian. Bookmark the permalink.